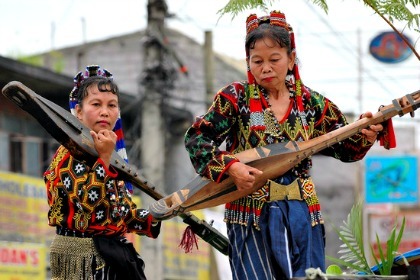 In addition to its famous eco-adventure sites, Tboli town in South Cotabato has opened a village where visitors could learn about the Tboli culture and hold events in a traditional setting. Just recently, the Tboli LGU, led by the Municipal Tourism Office, launched its Cultural Village and Traditional Tboli Long House in Barangay Lemsnolon, about 5 minutes ride from the town center. "The cultural village in Lemsnolon is a tourism destination where visitors can become immersed in the Tboli culture, specifically on weaving, music and chants, short stories, cuisine and others with the help of cultural masters," said Rodel Hilado, municipal tourism officer. Hilado added that the cultural village is convenient for meetings, conferences and events with a twist on culture and adventure. "Lemsnolon is also the best place to go if you want to conduct research on the Tboli culture," he stated. The cultural village's main feature is the traditional long house (Gono Bong) where visitors may stay and conduct meetings and buy Tboli products such as Tnalak cloth, brass wares, ornaments, and others. Food served in the traditional house are only Tboli cuisine. While in the long house, they may also visit the weaving room where they can witness Tboli women weaving shawls, malongs, and Tnalak cloth. An overnight stay at the Gono Bong costs only P150. Hilado explained that the project was "patterned from the cultural villages in Sarawak, Malaysia where all the tourist receiving centers and accommodations for MICE (meetings incentives, conferences and events) are made with the semblance of the cultural houses." At present, reservations for the Lemsnolon Cultural Village are being handled by the Municipal Tourism Office but will soon be transferred to an organization of local residents. Tboli is celebrating its 19th Seslong Festival from March 5 - 16. Seslong, according to Hilado, means trading or exchange. Mayor Dibu Tuan emphasized that visitors to the 11-day festivities will be treated to a celebration of "nature, culture, and adventure." Tboli is known for its adventure destinations including Lake Holon, Bakngeb Cave , Hidak Falls. Lake Holon, which was closed for annual rehabilitation on January 6 will be opened on Saturday for the Pilgrimage to Holon 2017: The Great #Hugot Trek on March 10-12. Bakngeb Cave is a suitable place for riverside picnic; it also offers a 3-kilometer water rafting that starts inside the Bangeb Cave. Hidak Falls is being developed as an exclusive resort inside a rainforest. Once operational, the by-reservation-only facility will offer traditional services including accommodation, cuisine, personal butler, massage spa and others on top of the experience of the nature featuring water falls in a rainforest.